Iflexion helped a US-based company with incentive management platform development to ensure consolidation of multiple incentive and engagement programs in a single hub. The customer is a US-based company that provides global clients with an incentive management platform for creating customized incentive, engagement, customer rebate, and employee recognition programs. With over 600 reward options to choose from, the solution enables various promotion and recognition schemes to be launched for millions of people around the world. Being a global leader in tailored incentive and engagement solutions, the customer serves 300+ enterprise clients, including Fortune 500 companies and the largest US brands. 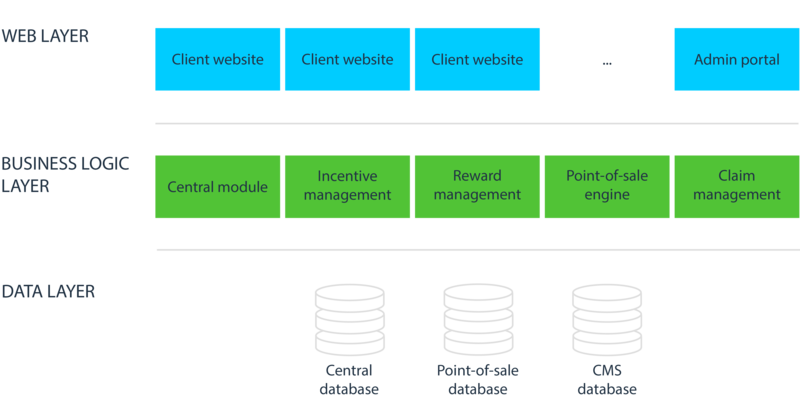 Initially, the incentive management platform was developed in a way that each client used their own web system for incentive program building, operation, and management. As the platform had hundreds of users, the customer had to support a large number of separate web systems. It wasn’t convenient for administrators and led to system instability. Moreover, due to the diversity of potential clients, the platform required frequent modifications and adding new functionality. Within the current solution architecture, implementation of changes affected the existing system components. The customer decided to update the existing solution creating new architecture and consolidating all the clients’ separate web systems into a single platform. It would ensure quick deployment of new systems, solution maintainability, scalability, and convenient administration via a unified management console. The customer turned to Iflexion to redevelop the incentive management platform in order to resolve existing issues and create necessary functional modules. Iflexion’s team analyzed the existing solution, conducted code review, and created a technical document with detected issues and recommendations. As the solution required a complete rework, together with the customer we concluded that it was economically more reasonable to develop it from scratch than to implement modifications to the existing solution. Thus, we redesigned the architecture and created a new incentive management solution from scratch keeping it platform-agnostic and easy to configure, with automated deployment capability. Incentive program management part for end users to build and configure their custom programs using a diverse set of modules. End users can adjust interface elements to comply with their design guidelines. Internal administration portal for content configuration and management, module management, user management, and client support. With the developed solution, administrators can manage and resolve issues without involving the development team. To support multiple clients within a single platform, Iflexion’s team developed a multitenant solution architecture with a single global administrative console and separate admin parts for each tenant. To ensure the architecture supports adding new features with minimal impact on the existing functionality, we divided the solution into five functional modules with their own business logic, user interface, functionality, and rules. Claim management module: claims for points. This division helped create relatively stand-alone modules so that the customer can quickly respond to the business requirements implementing necessary changes. We built the frontend part using the mixed classical/single page application approach with the following frontend frameworks and libraries: AngularJS, Bootstrap, jQuery, Modernizr. We implemented a service-oriented architecture (SOA) to ensure separation of work/processes and convenient implementation of new features with a minimal impact on the existing system components. For system stability, we implemented an optimal request/response size to transfer a minimal data set between the client and server, without executing unnecessary functions or database queries. For user authentication, our team implemented Single-Sign-On (SSO) for all modules. The services from each module are protected using Oath security token. Iflexion’s team has developed an incentive management platform with multi-language support for clients located all over the world. The solution allows the customer to deploy and support clients’ websites within one platform, as well as provides users with a convenient tool for incentive program creation and management. Initial solution review made by our team and implemented recommendations helped improve the code base and ensure the solution’s stable work. The redeveloped architecture allowed running multiple clients’ sites in a single app domain decreasing thereby hosting costs. The cloud-based eLearning platform developed by Iflexion improved the Customer’s business coaching services, providing the staff with better control over the education process and offering clients state-of-the-art online training experience. Iflexion delivered a scalable custom web solution that brings digital content sellers and buyers together on a single social media platform.